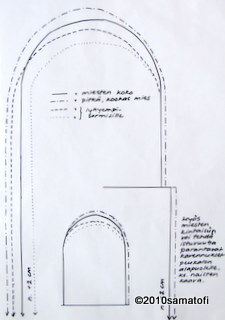 In the outline-patterns for women's mittens I have included a drawing of a hand (in red dotted line), and the black continuous line (_____) would be the mitten size for that hand. I hope that will help to get an idea of the suitable size for your own mittens. You can use these patterns or draw your own. Note, if you want to felt and full (shrink) your mittens afterwards, prepare to leave another +1 cm extra all around the pattern. Outline-patterns for children's mittens (pdf). Three different sizes: About 4 years old, about 8 years old, and about 11 years old. 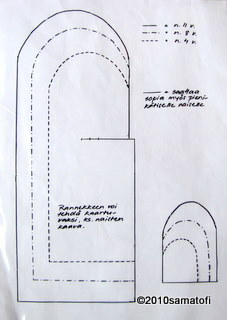 Outline-patterns for men's mittens (pdf). Four different sizes: 'ordinary' (_____) , large one (_._._._), and two for shorter-fingered (---- and ......). Some men have fingers shorter than those of an avarage woman, but yet their hand is much wider than woman's hand. 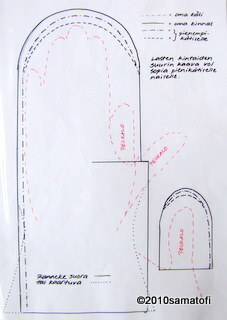 While nalbinding, place your mitten onto the outline-pattern every now and then, and compare the sizes. If you are nalbinding mittens for yourself, the most practical way, of course, is to try on the mittens onto your hands every now and then while making them. The outline-patterns may seem wide and long, but the 'additional' size just vanishes somewhere, and the finished mittens do not feel that large at all. The most crucial spot is the widest part of the hand, at the thumb joint, so it may be better to take that measure (around your hand), and make sure the outline-pattern is wide enough. Most nalbinding stitches do not stretch wide-wise that much, and mittens may shrink in use.